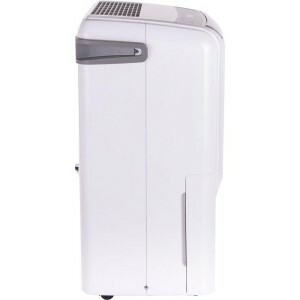 Honeywell - DH50W : Dehumidifier Review • The Air Geeks, reviews of air conditioners, dehumidifiers and air purifiers. 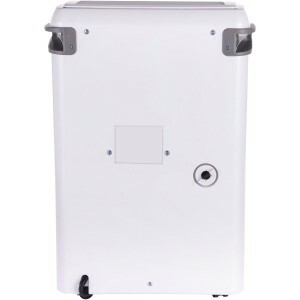 The DH50W is a portable dehumidifier that is designed and optimized to remove excess moisture from small rooms. This easy-to-use unit offers impressive features that enable users to control the humidity of their rooms with simplicity : a control panel that is very easy to read and use, a filter that is accessible and fairly easy to clean, and a general simplicity in the way basic functions are set up. If you are looking for a suitable dehumidifier for your small room, then you should consider this portable unit, by a brand that is renowned in the world of air products. But it is not, of course, without drawbacks. Let us take a deeper look. Dehumidifiers are designed to offer different capacities in order to suit the needs of different users. High capacity types are suitable for large spaces and vice versa. The DH50W is designed with a capability to draw up to 50 pints of moisture from the air within 24 hours. With a “real-life” dehumidification capacity of about half this amount, this is still a fair efficiency and make the dehumidifier suitable for medium rooms (up to 2500 square feet). However, depending on the design of the place where it is expected to dehumidify, it can also be used in relatively large rooms. The DH50W draws humid air from the front of its surface, and releases drier air from the top : it is therefore ideal to position in the corner of a room, where dry air will be propagated in the whiole room faster thanks to a vault effect of both walls and the ceiling. A dehumidifier can use various mechanisms to control and regulate the amount of moisture in the air. The DH50W displays a digital humidistat sensor to monitor the humidity in a room. If it senses that the humidity is higher that the set amount, it activates dehumidification to bring the air moisture down. This sensor also helps the system to minimize energy usage. However, the built-in humidity display was often found to overestimate the room humidity : not a big deal, as humidification will continue longer than theoretically needed, but still an imperfection. The DH50W is an Energy Star rated appliance that is optimized to consume minimum energy. Its high efficiency enables users to save money. In addition, this dehumidifier is “a low temperature operation appliance”, meaning that it can operate at a room temperature of 41 degrees without “breaking a sweat”! The DH50W features a 14.4-pint anti-spill water tank. This reservoir is ergonomically designed to enable users to empty the collected water with ease. What happens when the tank is full? This dehumidifier does not spill water on your floor. It is designed to alert you when the tank is full so that you can dispose the water. If you are not available to dispose the collected water when the system alerts you, it automatically goes off to prevent water spillage on your floor. You therefore don’t need to worry that the unit will flood your house in your absence. A dehumidifier can pull a lot of water from the air within a short time if the humidity is high. Under such conditions, the user may be required to keep emptying the tank as water accumulates. But who dreams of having to empty a tank every few hours? No one. You can, therefore, use the continuous drain option : it utilizes a standard garden hose to channel the collected water from the unit. When using this option, the unit does not give the full tank alert and runs continuously without going off. Are you looking for a humidity control system that you can easily move from one position to another? The DH50W features caster wheels and side handles to enable you to move it from one room to another conveniently. Its relatively small size (23.6 inches x 11.1 inches x 15.3 inches) and weight (43 pounds) make it a very portable tool. Quiet operation. The DH50W is designed and optimized to run quietly. With a noise level of 50 dBA, it is quieter than most units of same dehumidification capacity. Durable. Sturdy and well made. Less than impressive “real life” performance. The advertised “50 pints a day” turns out to be a mere 10-15 pints when used in real life conditions. Continuous operation option employs gravity. If you want to connect your system to a drain through a garden hose, you must place your appliance appropriately because the system does not have a mechanism for pumping the water - it uses gravity. Low measurement accuracy. This unit gives accurate temperature readings but the humidity values are inaccurate. Some users have attributed this to poor placement of the humidity sensor. This dehumidifier seems to pull moisture from the air well (I'm drawing 3 buckets per day) and is relatively quiet. However, if the unit isn't stopped for a significant amount of time before removing the bucket to empty it, the thing will continue to drain and leave a puddle on the floor in the minute or two it takes to dump the bucket. I'm surprised they didn't think to put a valve in that prevents the unit from draining when the bucket is out. As a result, I'll be returning it and trying a different model." As the owner of a grand piano, I keep close watch on the humidity levels in my home. Even with central heat and air, it can be difficult to control the moisture levels in my music room as the weather and seasons change. In the winter, when the air is dry, it’s easy to use a humidifier to add moisture back in, but with only the air conditioner in the summer, it’s much more difficult to keep the humidity level low. In the spring, when the temperature is lower and the weather more changeable and rainy, it is practically impossible to control the humidity since it is too cool to turn on the AC, so I felt this Honeywell dehumidifier would come in handy to control the music room humidity levels. One of the best things I like about this humidifier is that it arrives ready to plug in and use. The air filter is installed and there is no assembly. There are just a few pages of instructions, and after taking a few minutes to read them, you’re ready to dehumidify. The manufacturer recommends that the unit sit level for an hour or so to allow the coolant to settle properly in the coils. After that, you just plug it in and turn it on. You can adjust the desired level of humidity using the control panel, and it reads the current level of humidity so that you can set the level manually to gain your desired results. The first time I used this dehumidifier, the room showed a 60% humidity level. I set the desired level at 45% and turned it on. Within two hours, I had achieved the 45% level, which I thought was quite impressive. Some other features include automatic shut off, a continuous drain option, and a timer for even more automated dehumidifying. The control panel is very intuitive, making the unit incredibly easy to operate. The water reservoir slides smoothly out the front. Similarly, when the air filter needs cleaning, you just pop it out and vacuum it or rinse it out. Everything about this dehumidifier is simple and straightforward. One thing I did not like, however, was the noise level. It is too loud to play the piano while this is operating, as it sounds like a small hair dryer or handheld vacuum. That is obviously one of the trade-offs for the high power, but even on the low setting, it causes quite a racket. If this were being used in a basement or some kind of work room or something, I suppose the noise level would not be an issue, but for a music room, it is not ideal. Also, although the unit is on casters for ease of movement, the unit itself is quite heavy, so moving it from room to room, or up and down any stairs, is definitely a chore. At least the manufacturer realized this might be an issue and provided handles for lifting and moving the unit. In the end, the high power is a plus, despite the noise, and the weight of the unit also belies its power. 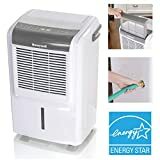 Because it is highly effective in dehumidifying and so easy to operate, I feel the good features mostly outweigh the bad, which is why I settled on a four star rating." You should consider this strong system. It effectively pulls moisture from the air to give your house a comfortable environment. In addition, it runs quietly and consumes minimum energy. Although most users like the intuitiveness of this tool, we think that its accuracy is faulty, and also feel that this powerful unit should have a mechanism for pumping the collected water out instead of relying on the gravitational force. Hence, we leave room for improvement in our rating.